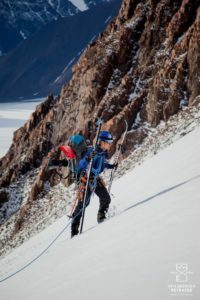 In the summer of 2016, a team of five from Oxford University traveled into the Arctic Circle to ski east to west across the island of Spitsbergen – part of a Norwegian archipelago. They retraced a 1923 expedition that had contributed a great deal of scientific knowledge about the region. Their goal is to conduct new research to tell the story of how the landscape has changed over nearly a century. For 32 days and 180 miles they hauled their sleds across the landscape looking to repeat the photos from 1923 and filming a documentary. Pursuing mountaineering objectives was another part of the Spitsbergen Retraced Expedition led by James Lam and you can learn more at svalbard2016.com James Lam, welcome to The Pursuit Zone.